Beautiful piano-based instrumentals - each individual song harmonizing with either Native American Flute and mandolin (Keith Secola), guitar, dobro (Paul Mayasich), or pedal steel guitar (John Ely). 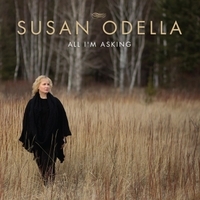 Susan Odella combines her unique piano-based instrumentals with mandolin and flute played by Keith Secola, award-winning figure in contemporary Native American music on four of her songs. She enlisted blues guitarist, Paul Mayasich, on three of her songs in which he played dobro and guitar. John Ely, formerly with Grammy Award winning Asleep at the Wheel, joined in on three songs playing pedal steel guitar. "All I'm Asking" is an eclectic blend of original music, especially appealing due to the variety of mesmerizing sounds.